Pasta has a reputation for being a heavy, carb-overloading, cheat-meal. But, it doesn’t have to be! This light, refreshing dish breaks through the confines of pasta barriers. It will leave you satisfied, but not overly stuffed! Follow the package directions to boil the pasta. Fresh pasta cooks quickly! In a small prep bowl, whisk together the lemon juice, olive oil, salt & pepper. In a serving bowl, gently combine the pasta, arugula, and dressing. 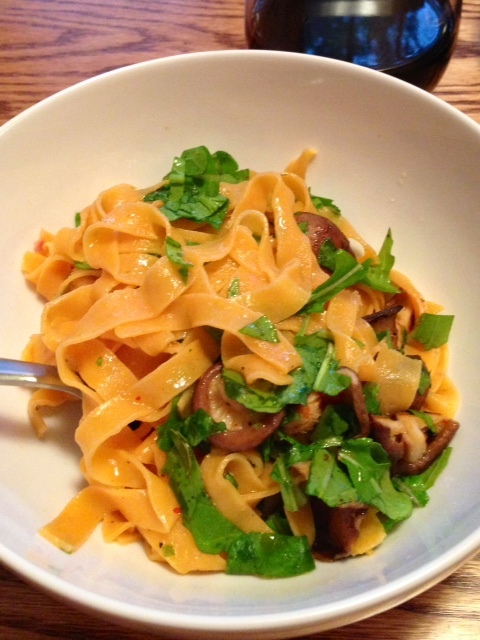 This entry was posted in Cooking In and tagged Chili, eating in, farmers market, organic, pasta, spicy, vegetarian. Bookmark the permalink. Sometimes simple is especially satisfying. Thanks for sharing.